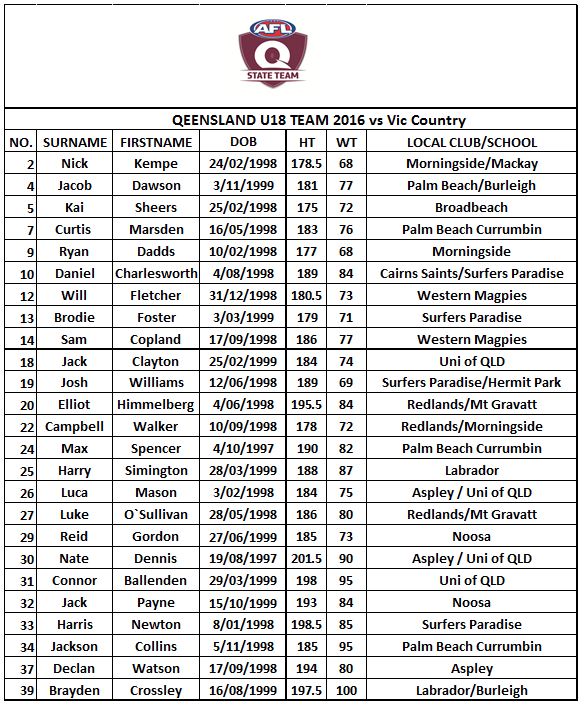 The Queensland State Academy class of 2016 gets down to business this Sunday in their first practice match against Victoria Country in Melbourne. Following this weekend, the Academy will play two TAC Cup games against the Northern Knights and Western Jets, before the NAB AFL Under 18 National Championship gets underway on May 8. The best players from the four Division Two teams will then be selected to play in a combined Allies team, who will play in the Division 1 championships. But before it all kicks off, we thought we would get to know this year’s crop, with a few facts about each player. Credits his coach since Under 12’s at Burleigh, Troy Crossely with a lot of his development. Lived in France for a year, and speaks French. Spent most if his life living in Darwin, before moving to Queensland in 2010.